As Tarleton prepares for this year’s homecoming theme “A Farmer’s Dream, a Texan’s future,” some Tarleton alumni prepare to venture back to recollect on college memories, and cheer on the Texan football team. Hannah Miller, an agricultural communications major, and recent graduate of Tarleton State University, is journeying back to Stephenville to reminisce on her glory days as a student at Tarleton. Photo courtesy of Hannah Miller’s Facebook account. Miller was a transfer student and only spent two years at Tarleton State University. 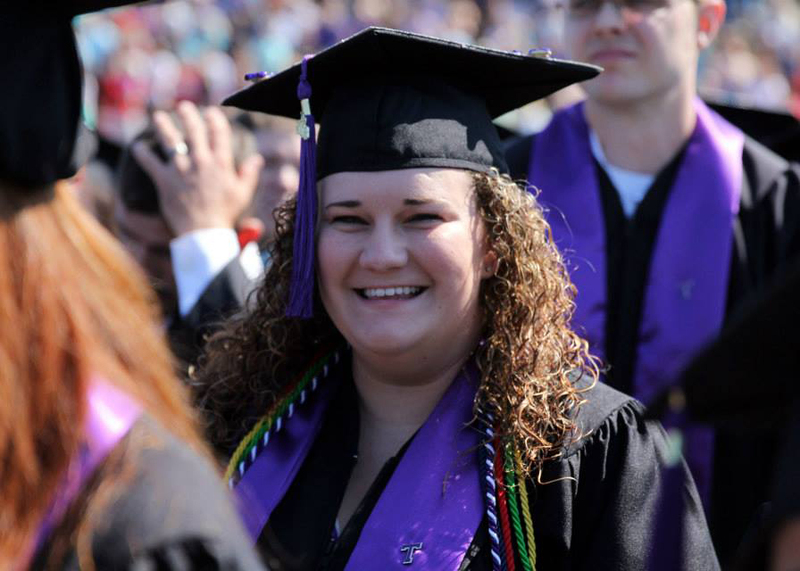 In those two years she managed to dive into student organizations and represented Tarleton with pride. Miller was a founding member of Tarleton’s Society of Professional Journalists as well as being involved in several other organizations on campus. In Miller’s time at Tarleton she received “Greek Woman of the Year” and “Sister of the Year” for her involvement in Sigma Alpha. Miller was also awarded “Social Media Guru” from the Texas Social Media Research Institute and served as the agriculture senator for Tarleton’s Student Government Association. Her other campus involvements included Duck Camp leader, officer of her sorority, Sigma Alpha every semester, as well as her membership in the Agricultural Communicators of Tomorrow. As an advocate for agriculture, Miller served as a national officer for ACT. Miller thought this year’s homecoming theme “A Farmer’s Dream, a Texan’s Future,” was a perfect fit. “Dodge has already dubbed this the ‘year of the farmer.’ This is a great time to relate students back to what Tarleton originally was– an agriculture school,” she said. Many traditions happen during the week of homecoming. Yell Contest, purple pancakes, beat the drum, the bonfire, and the parade are just a few of the memorable traditions Tarleton students and alumni both cherish. Miller thought back to the many memories made through preparing for and enjoying homecoming week. Miller is now a graduate student at Texas A&M University studying agricultural communication in the Agricultural Leadership, Education, & Communication (ALEC) department. Miller is also employed by Texas A&M as the ALEC department’s social media manager. As successful as Miller has been at Texas A&M, she is looking forward to coming back to Tarleton’s homecoming to enjoy the festivities. Alyssa Winn is a senior agricultural communications student from Fort Worth, Texas. She currently serves as the Executive Producer for Texan TV News.